Hong Kong's local food scene is heavily dominated by wonton noodle and dim sum, which are possibly the two most popular local dishes... Visiting the city without enjoying a hearty bowl of Wonton noodle in one of the humble eateries across Central, or Wanchai, is just as unthinkable as visiting Paris without dining at a local bistro, or passing through Athens without having a Souvlaki... This article will take you to Hong Kong's best wonton dens. 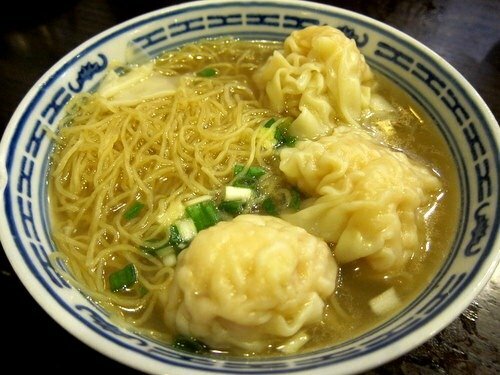 Wonton noodles (or Wan-tan Min) is normally served In Hong Kong in a steaming hot broth, garnished with green vegetables, and plump wonton dumplings, stuffed with prawn, with or without minced pork. The broth has to be slowly cooked with prawn shells, chicken and pork bones. The noodle should be as thin as a thread and springy in texture. The wonton dumpling itself should contain crunchy fresh prawn, wrapped in ultra-thin skin. Just before serving, the dish has to be sprinkled with thinly chopped yellow chives and shrimp eggs. Mak Man Kee Noodles, on 51 Parkes Street in Kowloon, just a short stroll from Jordan MTR Station, has been around for 40 years or so and still serves the same fantastic wonton noodle that has earned it its reputation, with thin skin and rich filing of either pork or shrimps, floating in a delicious slow-cooked broth with springy handmade noodles, that are traditionally prepared with duck-eggs. Still on Wellington Road, Wong Chi Kee Congee & Noodle is another legendary noodle house. Originally opened in Macau more than 50 years ago by Wong Wun Chi, who learned the secrets of noodles-making from a master in Canton, back in the 1940s, this popular restaurant is known not only for its wonton noodle, but also for its Congee, which some sayis the best in town. To know more about Hong Kong, including suggestions for day tour itineraries, sightseeing spots, recommended hotels and shopping tips, visit the Hong Kong Travel Guide, at metropolasia.com, where a whole section is dedicated to the best restaurants in Hong Kong. Roni Shwartz is a certified travel consultant and an expert to the cities of Hong Kong, Macau and Singapore. He writes for metropolasia.com - The ultimate online-guide for travel, dining and lifestyle in Hong Kong, Macau and Singapore. © Copyright by Hongkongscape.com. All rights reserved.